(will flesh out more later) Being more passive than most Braixens, he has not done well in battles with his fire and psionic powers. Instead he prefers to use them to help him with cooking - his biggest passion. A Pokemon based world that is not human/owner dependent and that the PCA (Poke' Combat Academy) exist in. Normal Braixen fur coloring with exception of blue eyes and 'bacon' stripes in his ear fluff. VERY fluffy compared to a normal Braixen! Aprons, large bibs or napkins when eating. Can wear shirts and pants but is a pain to get any to fit comfortably with all the extra fluff he has. 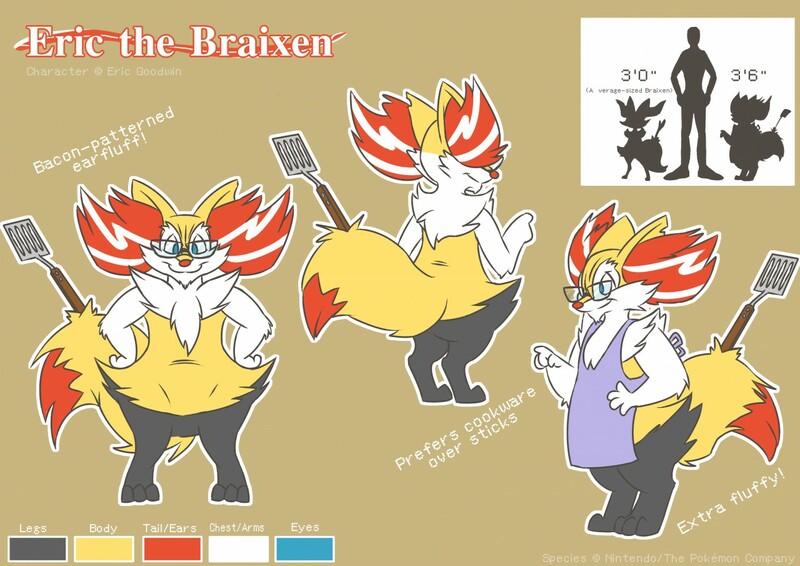 Glasses all the time, a wooden handled spatula (that he sometimes will ignite with his fire powers) always stick in his tail instead of a typical stick Braixens have.